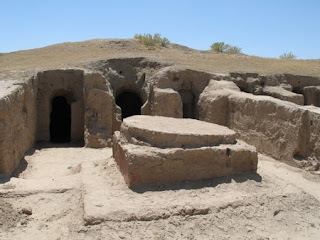 Around 2,500 years ago the ancient city of Termez was founded on the right bank of the Amu-Darya (Oxus) in a place convenient to cross the river. This strategic location later formed a major intersection of Great Silk Road routes. Over centuries it developed as one of the leading cities of the Graeco-Bactrian kingdom and later it flourished as an important centre of the Kushan Empire, which was established in the 1st century AD. Most Kushans are believed to have followed Zoroastrianism, however, all religions were tolerated and the city became a centre of Buddhist scholarship. It is from Termez that many missionaries departed for Sogdiana in the north, for Margiana in the west, for China and Tibet, where they propagated Buddha's teaching. The Chinese monk Xuan Zang, who made a pilgrimage to India early in the 7th century in search of holy Buddhist books, mentioned his visit to shrines around Termez in his famous travelogue Records of the Western World. 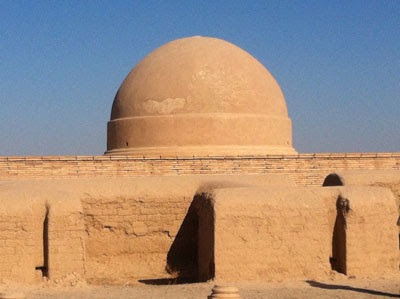 There are three major Buddhist sites that you can visit today near Termez. Kara Tepa is one of the world’s oldest surviving Buddhist cave monasteries. The first archaeological excavations took place there in 1936 and archaeologists discovered three tiers of rock-hewn cells for monks. The excavations revealed a clearly visible layout of the ancient structures. In the underground chambers archaeologists found fragments of statues of Buddha and Bodhisattvas, statuettes of dragons and of a winged lion, as well as wall paintings with one of the world’s oldest images of Buddha surrounded by monks. On the same walls there are portraits of donors, who were rich enough to order the construction of the temple. In the cells ceramic lamps, reliquary boxes, coins of the times of Kanishka I and the Sassanid rulers were found. The Kara Tepa complex also had a dormitory where pilgrims could take shelter. The walls of this dormitory still bear a surviving graffiti drawing of a Buddhist stupa. NB: In April 2013, the Tashkent authorities issued a document to permit me to visit Kara Tepa. Regrettably entry was denied by the local authorities in Termez. Finally, in October 2013, I was granted access by local authorities to the site. If you have the official letter from Tashkent, I recommend you make Kara Tepa your first stop in the mornng. About a kilometre away to the north of Kara Tepa lie the ruins of another Buddhist temple and monastery complex, Fayaz Tepa. The main structure of this monumental complex was its sanctuary decorated with paintings and sculptures of Buddha. The sanctuary was connected with the inner yard surrounded by pillars supporting a wooden roof whose fragments have survived to the present time. In the northwestern part of the structure there were cells for monks and an altar with holy fire. The southeastern wing consisted of utility rooms, a refectory still containing stoves for cauldrons, tandyr ovens for baking bread and a large number of ceramic dishes. Of great interest are the remains of the large stupa near the temple. Inside the stupa there is a smaller, older stupa, whose dome with the reliquary and the hole for the symbolic “umbrella of honour” once crowning the many-tier chatiya are still in good condition. Scholars date the monastery of Fayaz Tepa to the 1st century A.D. It functioned until the beginning of the 4th century when, together with Kara Tepa complex, it was looted by the Sassanid shahs. 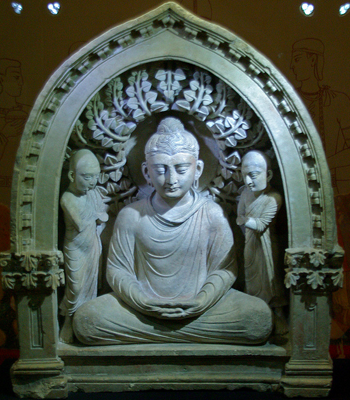 Murals showing the Buddha were uncovered at the site as were samples of stone and ganch sculpture, coins and fragments of ceramic vessels with Indian inscriptions. 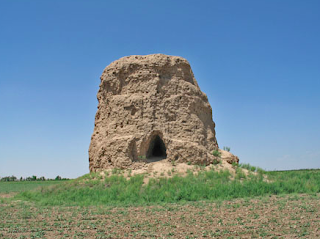 The Zurmala tower dates from the 3rd century A.D.
Today Uzbek scholars collaborate with Japanese, French and other archaeological teams in the area around Termez. In October 2012, a splendid sculpture of white limestone, about 40cms in height, was discovered in good condition. It is part of the Greco-Buddhist friezes that adorned the temple on Chingiz hill. This, and other precious finds, are displayed in Central Asia's only archaeological museum, which opened in Termez in 2002. The museum, which is open daily from 9:00 am - 5:00 p.m. houses more than 27,000 exhibits in the archives and exhibition halls. Signage is in Uzbek, English and Russian, however, it is far more interesting if you visit with a guide. The Surkhandarya province, of which Termez is the capital, is a fascinating area to visit. Uzbek Journeys arranges excursions there that take in the Buddhist and Islamic sites.